Following General Motors' historic return as a publicly traded company Thursday, President Barack Obama said the U.S. government is on track to more than recoup the nearly $50 billion it invested in the Detroit automaker. With GM once again becoming a public company, Obama said, the government's 61% stake in the carmaker was cut nearly in half. "What's more," he said, "American taxpayers are now positioned to recover more than my administration invested in GM." 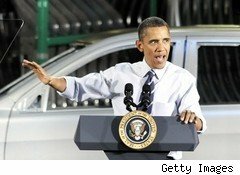 Obama said the controversial bailout saved 1 million jobs in all 50 states at a time when Americans needed them and helped reinvigorate a moribund U.S. auto industry. He noted that all three domestic automakers -- GM, Ford Motor (F) and Chrysler Group -- "are in the midst of their strongest period of job growth in more than a decade." Since GM and Chrysler emerged from bankruptcy in mid-2009, the auto industry has created more than 75,000 new jobs, Obama said. More important, the president said, the U.S. auto industry is once again competitive, "capable of going toe-to-toe with any other manufacturer in the world" -- a feat that two years ago "seemed impossible." He also noted that all three companies, for the first time in six years, are operating at a profit. GM announced last week that it earned $2 billion in the third quarter, while Chrysler reported a net loss of $84 million during the same three months, but it was profitable on an operating basis. Critics of the domestic automakers had written off the industry, Obama said. But if the government hadn't acted, the fallout would have resulted in catastrophic job loss, devastated communities and costs to governments measured in tens of billions of dollars in additional safety net programs and lost revenue. The president acknowledged that the last two years, which have seen the nation's jobless rate rise to around 10% and stay there, haven't been easy on anybody: "They haven't been without pain or sacrifice. . .and obviously we still have a long road ahead and a lot of work to do to rebuild this economy [and] to put people back to work." GM shares ended the day's trading at $34.19 a share, up $1.19, or 3.6%, from the $33 a share IPO price set on Wednesday. Shares moved as high as $35.74 shortly after trading began but moved steadily lower throughout the day. The company's triumphant return to Wall Street included the sound of a car horn blaring shortly after the bell was rung at the New York Stock Exchange, signaling the beginning of trading. More than 100 million shares of GM stock traded hands within the first 15 minutes that the market was open. Despite the celebratory mood, GM executives remained subdued, noting that challenges lie ahead. "There is a lot of optimism and a lot of confidence in GM these days," said CEO Daniel Akerson in a conference call with reporters. "But we know how we arrived here. We know what went wrong, and we believe we've learned a lot from that." Notwithstanding the successful IPO, some issues remain, including the government's remaining stake in GM. The U.S. Treasury raised $23 billion in the sale of its shares today, but it's barred from selling more shares for six months. Further, when Treasury does decide to sell again, the remainder of its stock would have sell at roughly $53 a share to recoup U.S. taxpayers' full investment in GM.